SI joint syndrome continued its fall from FASHION due to the lack of reliable clinical studies confirming its very existence. Although many manual therapists quietly continued treating this disorder with some success, no one was able to put forward a convincing biomechanical theory explaining how the sacrum becomes stuck “crooked” between the two innominate bones. Physicians were hesitant and reluctant to envision a joint with so little movement causing so much pain, while manual therapists countered that its limited motion is vital to proper lumbar spine functioning. So, the SI joint controversy raged until the late 1970s, when renowned manipulative osteopath Fred Mitchell Sr. introduced an innovative and practical biomechanical model that helped demonstrate normal and aberrant SI joint movement patterns occurring in most individuals2. Using muscles as levers to correct lumbopelvic restrictions, Mitchell’s muscle energy technique (although slightly flawed) spurred a RENEWED interest in the SI joint as a source of back pain. Figure 1 and Figure 2 demonstrate a modified muscle-energy assessment and correction routine for a painful left unilateral extended sacrum. Since most SI joints only move about 2 to 4 millimeters during weight bearing and forward bending, they are described as a gliding-type joint. This motion is quite different from the hinge-type articulation at the knee or the ball-and-socket motion of the hip. Considered a viscoelastic joint, the SI’s major movement comes from ligamentous stretching. Therefore, its primary function within the pelvic girdle is to provide shock absorption for the spine by stretching in various directions. When sacroiliac joints work in perfect harmony with the third bony articulation of the pelvis (symphysis pubis), a marvelous self-locking mechanism develops that helps us walk. Aided by power GENERATED by the hip abductors (gluteus medius/ minimus, TFL and piriformis), the pelvic joints brace the weight-bearing side during gait. This locking system, termed force closure, allows smooth transference of body mass from one leg to the other (Fig. 3). 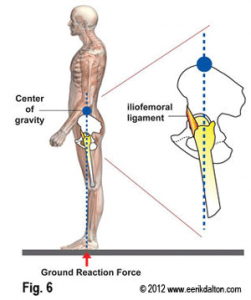 Although no muscles directly bind down the three pelvic joints, when working synchronously with the SI ligaments they provide the pelvis − “the great adapter” − with a remarkable antigravity springing system that can absorb both ascending and descending forces (Fig. 4). During the aging process, there is an increase in the grooves on the opposing surfaces of the sacrum and ilium, which reduces available motion of the SI joint. This is a perfect example of the body’s innate wisdom attempting to sacrifice complexity of motion for stability. An interesting note is that the age with highest incidence of disabling back pain (25-45 years) is the same age at which the greatest amount of motion is available in the sacroiliac joints. 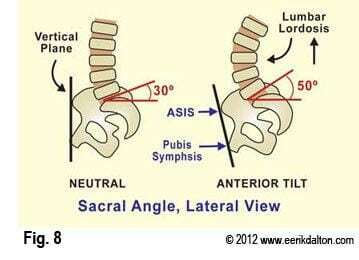 It’s not uncommon for an SI joint to become stiff and permanently lock as we age. This may be a good reason for massage therapists to begin incorporating specialized soft-tissue mobilization techniques on a regular basis, to maintain joint-play and prevent agonizing arthrosis and arthritis from developing. Due to the small amount of sacroiliac movement and the joint’s inherent biomechanical complexity, proper assessment can be tricky. 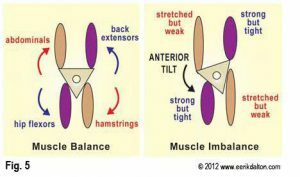 Frequently, muscle imbalance patterns develop as tissues become strained from overuse, underuse or abuse. In the early stages of a typical SI pain episode, protective muscle spasm arises as the sacrum gets stuck side-bent and rotated between the ilia, usually from a forward-bending and twisting incident (Fig. 5). Sustained isometric contraction produces muscle toxicity and weakness causing increased SI ligament loading and overstretching. As the articulating joint surfaces become jarred loose, ligament microtearing creates an inflammatory response. Sensitive chemoreceptors bombard the spinal cord and brain with noxious stimuli, causing the brain to layer the area with protective muscle guarding. This is the beginning of a therapeutically challenging pain/spasm/pain CYCLE that often is hard to break. It’s possible, however, to eliminate pain emanating from hypermobile joints by restoring proper pelvic alignment, frictioning the loose ligaments and addressing core strengthening exercises. Although the three bones of the pelvis frequently are at the seat of a “primary” lesion, I have found that a missing key in successful correction of recurrent SI pain is motion-restricted hip joints, i.e., poor alignment of the femur in the acetabulum. 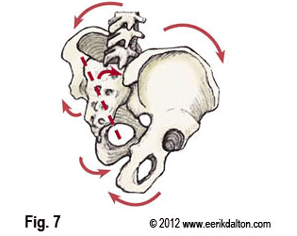 For the pelvis to effectively absorb the forces imposed upon it, the hips must be aligned and functioning properly. Normally, it’s not the gross motions creating dysfunction within the hip’s truncated joint capsule, but restrictions of minor movements such as iliofemoral ligament adhesions (Fig. 6). Therefore, a rational treatment approach would begin with mobilization of the adhesive hip capsule, followed by step-by-step restoration of iliosacral alignment (movement of ilia on sacrum) and sacroiliac alignment (movement of sacrum between the two ilia). Vladimir Janda, MD, reminds us that: “Any alteration in joint function caused by capsular restriction or loss of joint play affect muscles that cross the dysfunctional joint either through inhibition (weakening) or facilitation (tightening).”2,3 Following this line of thought, a fibrosed hip capsule (usually right) could reflexively spasm and shorten the neighboring iliopsoas muscle, causing reciprocal weakness in its antagonist gluteus maximus. This commonly seen muscle imbalance pattern produces a right anterior inferior rotated (AIR) ilium that refuses to stay aligned no matter how much “psoas-beating” the therapist performs (Fig. 7). Many in today’s flexion-addicted society suffer from anterior hip capsule adhesions and tight psoas muscles that “glue” the femur into a flexed position, preventing adequate hip extension during gait. But we have to walk … so what happens? As the right leg swings back into extension, the SHORT iliopsoas and fibrosed hip capsule drag the already anteriorly rotated right ilium more forward and down, causing increased lumbosacral angle, facet joint and disc compression, greater ligament laxity, compensatory lumbar scoliosis and pain (Fig. 8). Figures 9-11 demonstrate a nice pelvic balancing routine I’ve found effective for releasing adhesive hip capsules, lengthening iliopsoas and correcting iliosacral alignment. Competing athletes suffering recurring unilateral hamstring pulls always should be evaluated for hip capsule restrictions that might be causing iliopsoas facilitation and glute max inhibition. The most common cause of persistent hamstring injuries results from an altered firing order pattern, whereby a weak gluteus maximus fires late during hip extension, forcing the hamstrings to do all the work. Since motion-restricted joints can reflexively weaken associated muscles, it’s a good idea to mobilize all capsular restrictions and lengthen tight postural muscles before attempting to strengthen muscle groups perceived as weak. Once optimal hip range of motion and iliosacral alignment are restored, sacroiliac problems often spontaneously correct themselves … but not always. If low back, buttock or leg pain persists, the therapist must be EQUIPPED with proper assessment and treatment tools to effectively deal with SI joint syndrome.